My developmental art classes focus on the process of creating, rather than the end result. This age group thrives on process, and it is important for them to be able to freely explore art materials and techniques without too much of an end result in mind. I personally believe that some of the most beautiful art you'll ever see is created by preschoolers who were given the opportunity to do it all by themselves! I help them and gently guide them when needed, but I feel that my job in this class is mostly to set up the materials and provide the children with a space and time to explore art without expectations from me. I plan all classes to be developmentally appropriate for each student. My classes are small so this allows for plenty of one on one time with each child, and I can cater to their individual art needs. This year I will start offering a 15 week session for this class. If your child has been in the 10 week session and you'd prefer to continue doing that, you may. But if your child would enjoy 5 extra weeks in each session, I am now offering that as an option. This is an exciting new class for toddlers! Sensory play is beneficial for this age group, and I will give children the opportunity to explore a wide range of textures, colors, art materials, and more. Various clays & doughs, water trays, sensory bags and boxes and more will be part of this class. In each class I will show Mom (or Dad..or Grandma or whoever brings the student!) how to put together each activity so that they can do them at home if they wish. Many of these projects are fairly simple, yet have a big impact on your child's development. I will be offering 2 intro classes to start with, where I will talk a bit about my plans for this session, and we will work on two projects together. I will also show a variety of upcoming projects as well, so that you'll know what to look forward to if you sign up. Sign up sheets will be available at these classes. If you can't attend one of these but you are interested, or would like more information, get in touch with me. After these demo classes I will finalize plans for days, times, etc. for weekly classes. 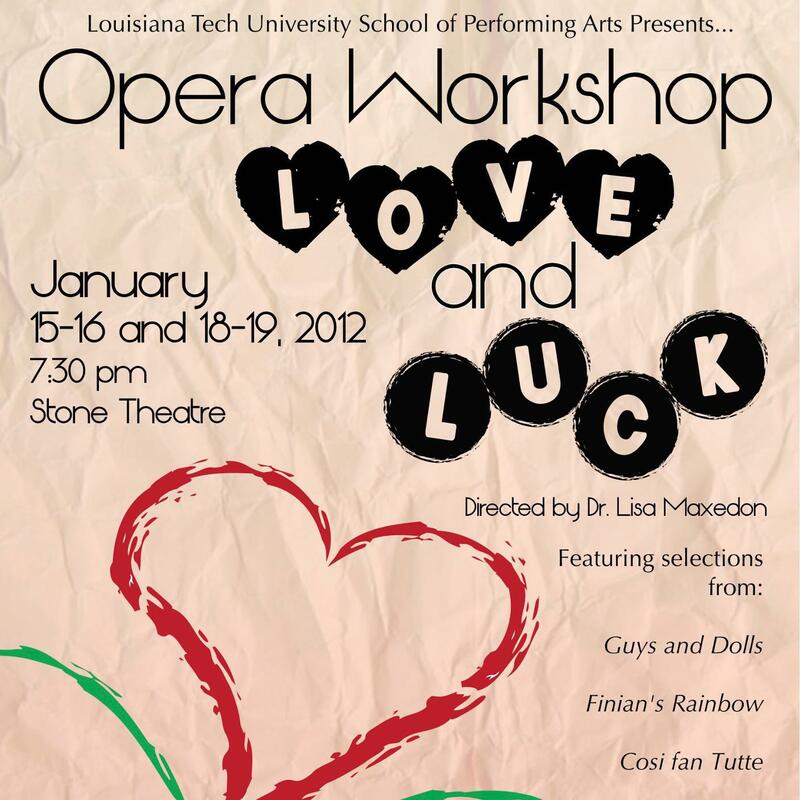 Next, we have Louisiana Tech's School of Performing Arts and their Opera Workshop: Love and Luck. The Louisiana Tech University Theatre is proud to announce the cast for the Winter Quarter production of Opera Workshop: Love and Luck, directed by Dr. Lisa Maxedon. Performances are scheduled to run January 15-16 and 18-19 at 7:30 pm in Stone Theatre, located in the Howard Center for the Performing Arts, on the Corner of Adams Boulevard and West Arizona Avenue. The Box Office, located in the lobby of Howard Auditorium, will open for general admission Tuesday, January 7th. Tickets are $12 for adults, $5 for students and continuing education with valid I.D., $8 for children (under 14) and seniors (65 or older), $7 for groups (10 or more). Tickets can also be purchased. Destiny…fortune….fate! This year’s Opera Workshop is an evening of scenes and songs from classics both old and new in the American Musical Theatre canon. Pirates of Penzance, A Game of Chance, Gypsy, Beauty and the Beast and many other Broadway favorites are featured in this fantastic production. A true collaboration within the School of the Performing Arts, Opera Workshop showcases the talents of both the Music and Theatre department and gives you a night of unforgettable musical performances. The cast includes Chastin Seeby, Christian Amos, Adam Garcia, Travis Hearold, Bryant Williams, Ryan Willis, Alyce Tarver, Melanie Slack, Rebecca Harris, Valerie Lott, Travis Hearold, Destiny Garcia, Carolyn Smith, Michelle Coker, Katherine Finney, Jamie Robinson, Olivia Loewer, Christian Amos, Alicia Goodman, Brooke Jones With Dr. Laura Thompson as Game Show Host, Dr. Sean Teets as the Special Guest, and Accompanist Shayla Blake. NCLAC Board Member Dr. Jeffery R. Hankins, an Associate Professor of History at Louisiana Tech University, was invited to join the international advisory board for the British Scholar Society, a non-profit educational organization dedicated to Britain’s interactions in the world from the seventeenth century to the present, to concentrate British history during the 1600s and 1700s. Congratulations to Dr. Hankins! You can read more about this special opportunity here. Several NCLAC student artist members will be exhibiting at Louisiana Tech's Enterprise Center, with the opening reception this Friday, January 11, from 6-8pm. The show is comprised of work by first and second year MFA students. Make plans to attend. Louisiana Tech's MFA program is thriving; be sure to see these young artists' works!